theclockonline students can sell Statistics for Business &Economics, Revised (with XLSTAT Education Edition Printed Access Card) (ISBN# 1337094161) written by David Anderson, David R. Anderson, Dennis Sweeney, Dennis J. Sweeney, Thomas Williams, Thomas A. Williams, Jeffrey D. Camm, James Cochran, James J. Cochran and receive a check, along with a free pre-paid shipping label. 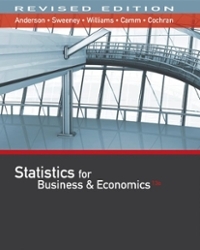 Once you have sent in Statistics for Business &Economics, Revised (with XLSTAT Education Edition Printed Access Card) (ISBN# 1337094161), your Plymouth State University textbook will be processed and your check will be sent out to you within a matter days. You can also sell other theclockonline textbooks, published by South-Western College Pub and written by David Anderson, David R. Anderson, Dennis Sweeney, Dennis J. Sweeney, Thomas Williams, Thomas A. Williams, Jeffrey D. Camm, James Cochran, James J. Cochran and receive checks.